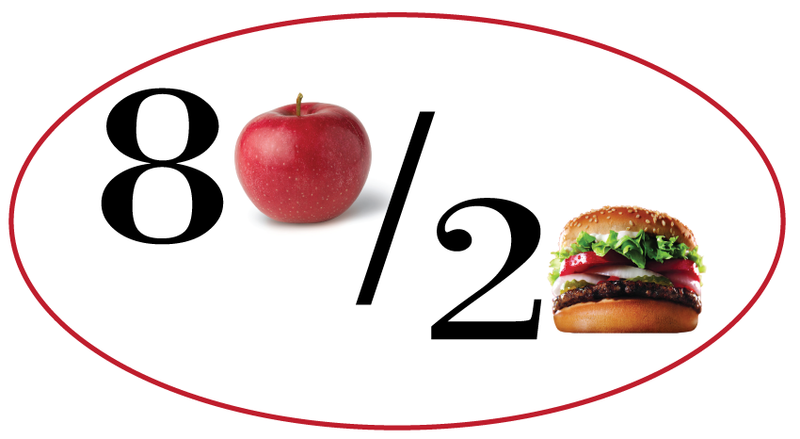 The 80/20 principles is not a diet. It is a lifestyle change that invites balance and moderation into our daily consumption of food and sustainable weight loss into our lives. Rigid limiting diets fad diets are temporary fixes at best and invite boredom, excuses and failure. Depriving yourself of sweets and treats all the time is neither realistic nor sustainable. The 80/20 rule on the other hand allows you to be human. By allowing special indulgences into your meal plans, you will feel happier, more fulfilled (no deprivation) and healthier, all resulting in a slimmer you. If you want to be social and enjoy a meal and a drink with some friends you have an open door to do so…without the guilt. Guilt is never a good thing…it is the poison that steals our momentary joy. When you eliminate guilt you no longer look at food as your enemy. This new perspective eliminates any judgments or conditions you would otherwise pace on your meal choices and food becomes your friend. Consistency and moderation are the key to it all. You choose healthy foods 80% of the time and allow your sweet or salty treat indulgences 20% of the time. This eliminates calories counting, focusing on certain food groups while leaving others out altogether and the worst culprit of all…denying yourself your favorite foods. When we live in a real world (out of the lies and fantasies that companies want us to believe) we realize we cannot be 100% all the time. It’s not human nor realistic to even ask that of ourselves. However it is human to ask to “be on” 80% of the time and the key is it is doable. It’s very hard to stay motivated at something you don’t like if you have to do it 100% of the time. The 80/20 rules helps eliminate the stress and anxiety we feel by trying to “measure up” all the time. It eliminates the mental struggle of constantly having to be “on”. And that’s what you need to focus on daily…the 80/20 principle. However, be aware that just because you are allowing yourself to enjoy some of your favorite foods without the ensuing guilt, it’s still not an invitation to fill your stomach with useless excess sugar and fat. The 80/20 principle should never be used as an excuse. It is about guilt free moderation and that means there should be no foods considered “bad” nor any guilt associated when you are enjoying your “treat” days or moments. Portion sizes should still be taken into consideration. Remember, your focus should still be losing weight and eating healthy. Your diet should include a variety of lean proteins (like fish and chicken) low-fat dairy, fresh veggies and fruits and unprocessed whole grains for 80% of the time. Because you have fewer restrictions crowding your mind, you’re more likely to stick to the 80/20 lifestyle than fad or traditional diets. It’s always best to employ what you want in your future now. In other words, diets don’t work.Make it part of who you are, part of your life rather than a “flash in the pan” dream.